Two weeks before Harvey's flood waters engulfed much of Houston, President Donald Trump quietly rolled back an order by his predecessor that would have made it easier for storm-ravaged communities to use federal emergency aid to rebuild bridges, roads and other structures so they can better withstand future disasters. Now, with much of the nation's fourth-largest city underwater, Mr. Trump's move has new resonance. 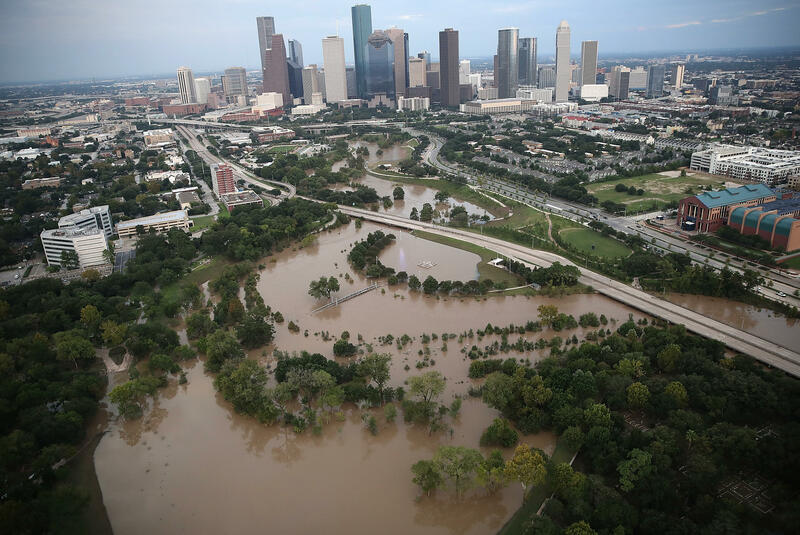 Critics note the president's order could force Houston and other cities to rebuild hospitals and highways in the same way and in the same flood-prone areas. Mr. Trump's action is one of several ways the president, who has called climate change a hoax, has tried to wipe away former President Barack Obama's efforts to make the United States more resilient to threats posed by the changing climate. The order Mr. Trump revoked would have permitted the rebuilding to take into account climate scientists' predictions of stronger storms and more frequent flooding. The government was still in the process of implementing Obama's 2015 order when it was rescinded. That means the old standard — rebuilding storm-ravaged facilities in the same way they had been built before — is still in place. Mr. Trump revoked Obama's order as part of an executive order of his own that he touted at an Aug. 15 news conference at Trump Tower. That news conference was supposed to focus on infrastructure, but it was dominated by Mr. Trump's comments on the previous weekend's violence in Charlottesville, Virginia. Mr. Trump didn't specifically mention the revocation, but he said he was making the federal permitting process for the construction of transportation and other infrastructure projects faster and more cost-efficient without harming the environment. "It's going to be quick, it's going to be a very streamlined process," Trump said. Asked about the revocation, the White House said in a statement that Obama's order didn't consider potential impacts on the economy and was "applied broadly to the whole country, leaving little room or flexibility for designers to exercise professional judgment or incorporate the particular context" of a project's location. Obama's now-defunct order also revamped Federal Flood Risk Management Standards, calling for tighter restrictions on new construction in flood-prone areas. Republicans, including Sen. John Cornyn of Texas, opposed the measure, saying it would impede land development and economic growth. Revoking that order was only the latest step by Mr. Trump to undo Obama's actions on climate change. In March, Mr. Trump rescinded a 2013 order that directed federal agencies to encourage states and local communities to build new infrastructure and facilities "smarter and stronger" in anticipation of more frequent extreme weather. Mr. Trump revoked a 2015 Obama memo directing agencies developing national security policies to consider the potential impact of climate change. Obama's 2015 order was prompted in part by concerns raised by Colorado Gov. John Hickenlooper after severe flooding in his state two years earlier. Hickenlooper was dismayed to learn that federal disaster aid rules were preventing state officials from rebuilding "better and smarter than what we had built before." The "requirements essentially said you had to build it back exactly the way it was, that you couldn't take into consideration improvements in resiliency," Hickenlooper, a Democrat, said Tuesday. "We want to be more prepared for the next event, not less prepared." Bud Wright, the Federal Highway Administration's executive director during George W. Bush's administration, said this has long been a concern of federal officials. He recalled a South Dakota road that was "almost perpetually flooded" but was repeatedly rebuilt to the same standard using federal aid because the state didn't have the extra money to pay for enhancements. "It seemed a little ridiculous that we kept doing that," said Wright, now the American Association of State Highway and Transportation Officials' executive director. But Kirk Steudle, director of Michigan's Department of Transportation, said states can build more resilient infrastructure than what they had before a disaster by using state or non-emergency federal funds to make up the cost difference.